The Temple of Isis. If you are thinking, Wait, isn't Isis an Egyptian goddess? you are absolutely right. But Rome had contact with Egypt for many years, and all things Egyptian were very fashionable at the time of the eruption. This temple dates to the 2nd century BC. The temple included an underground cistern allegedly containing the waters of the Nile (perhaps symbolic, or perhaps imported in barrels?). In Egypt, Isis was a mother-goddess, often depicted in mother-and-child pieces which may have been the artistic origin of the Madonna-and-child theme in Christian art. Her temples in Egypt were frequented by healers and mystics, who were believed to be able to interpret dreams and control the weather. In Rome, she seems to have been associated with wisdom. 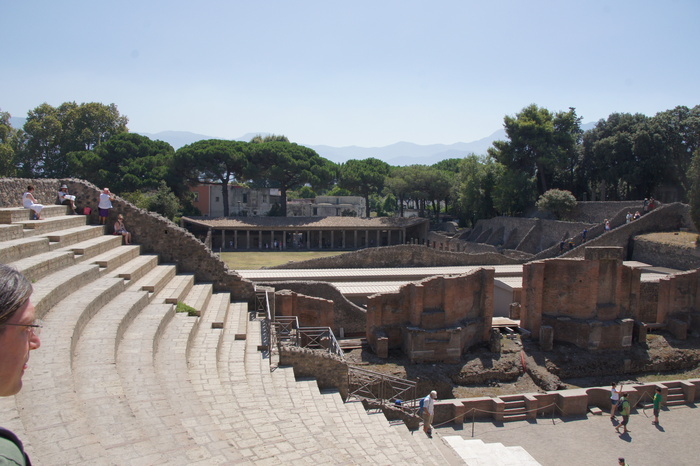 Pompeii's large theater. Most of the seating has been reconstructed: the lighter-color seats are original. Looking down on the stage of the large theater and, behind it, the gladiator barracks (with columns). Before the earthquake of 62, this area had been a park for guests of the theater. After the earthquake, the outer ring beyond the columns was convered to rooms, and a larger room served as a prison. Originally, gladiator combat was a part of funerary ceramonies, and typically the combatants were prisoners. 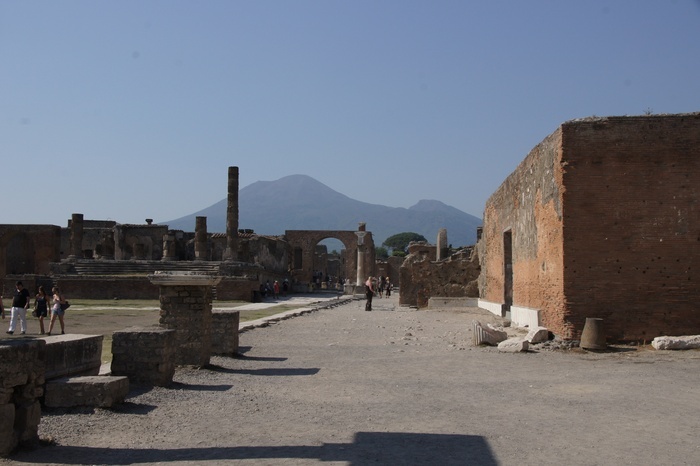 By the time of the destruction of Pompeii, some gladiators were voluntary combatants, while others were still prisoners (often prisoners of war). For the Romans, a warrior who had been captured as a prisoner was dishonored, and gladitorial combat offered a chance to redeem himself. A slave or prisoner who fought as a gladiator could earn his freedom. For non-citizens, life as a gladiator offered a chance at otherwise unattainable fame and fortune. Eric on the Triangular Forum. The forum was built on the edge of a cliff (or at least a very steep hill) which constrained its shape from the usual Roman rectangles. From here, on a clear day, you could see out to the Bay of Naples. Ace by some other columns on the Triangular Forum. 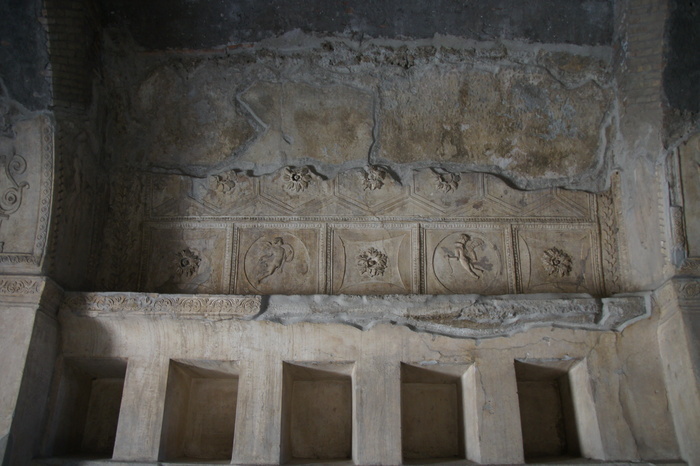 The Stabian baths are the oldest in Pompeii, with pieces dating to the 4th century BC. 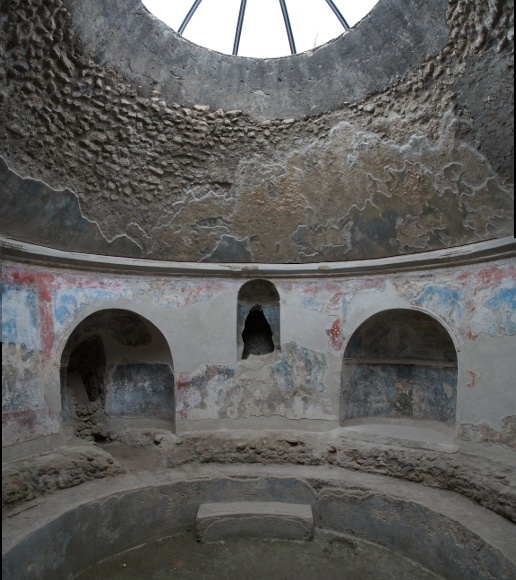 This room is the frigidarium of the men's baths - a pool of cold water that would serve as a final rinse after using the hot baths. The women's apodyterium (changing room) in the Stabian baths. The niches would be used to hold clothing and shoes, just like the lockers in today's saunas. 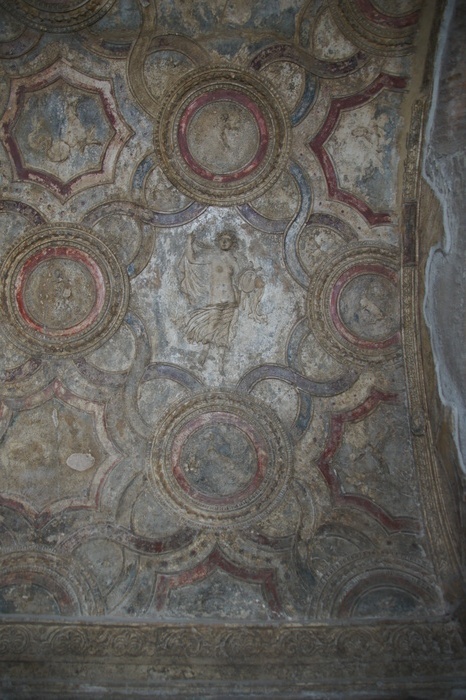 The ceiling in part of the men's baths. Once again, the figure recalls its descendents in the Catholic churches: figures with flowing robes surrounded by cloud-like patterns are a common ceiling motif. 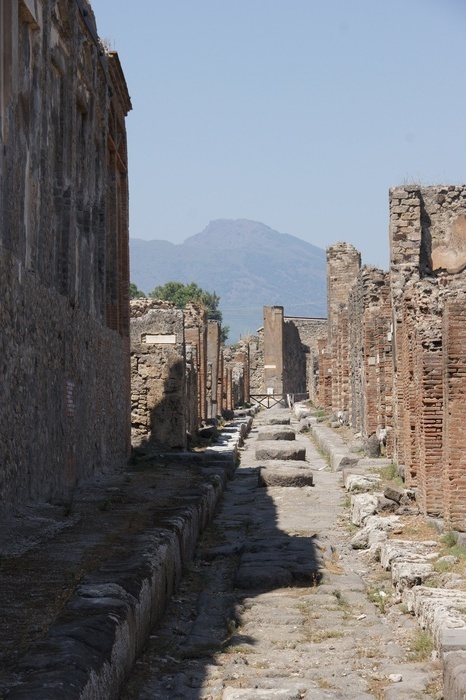 One of the smaller roads in Pompeii. The roads were used by carts, people would walk on sidewalks, and use the stepping stones to cross the street. Roman comedies suggest that it was common practice to throw trash, including the contents of chamber pots, out of the window into the street. Apparently there was a fine for hitting passerby, but only if they were injured. However, assuming everyone was doing this, the street must have been the last place in the city you'd want to walk. 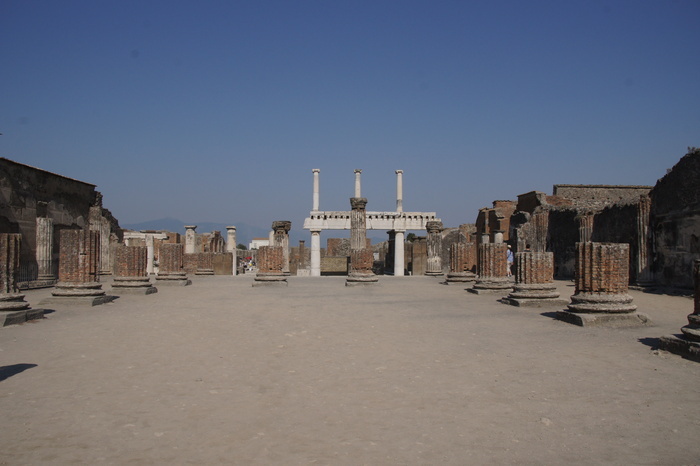 Pompeii's forum. 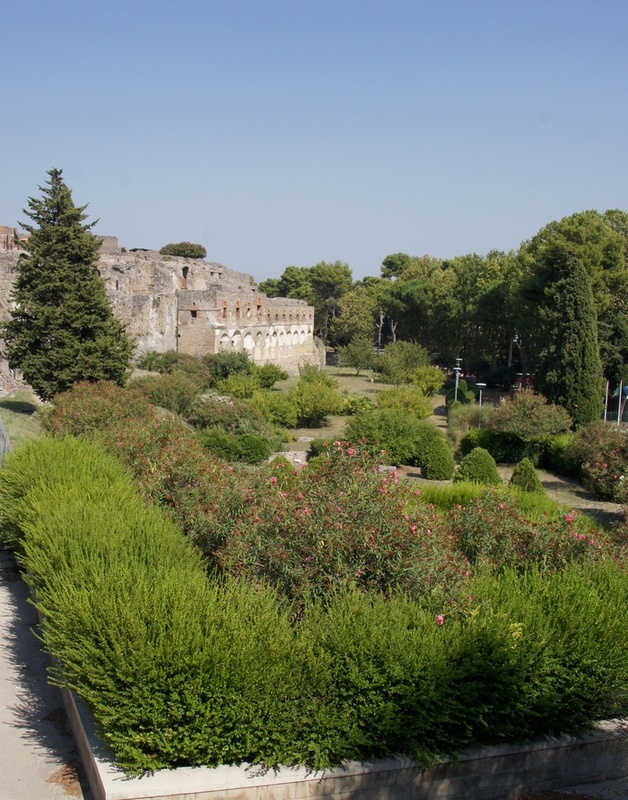 The forum in Roman times was a market, but also home to public services and public speeches. 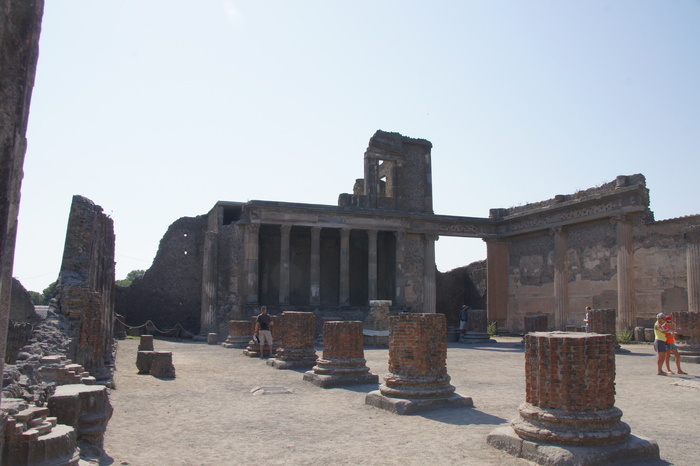 In Pompeii the municipal offices were on the south side (offices for public officals overseeing matters such as maintenence of public buildings, organization of festivals, judges, tax collection, and public contracts). 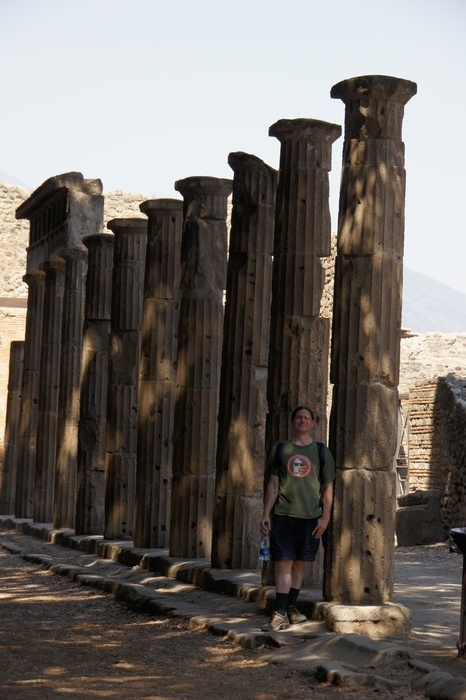 There were at least four temples on the forum, including the Temple of Lares Publici. Unlike the Greek gods and their Roman counterparts, the Lares are associated with a place or a domain. The lares domestici would be the spirits of domestic things, and the lares publici the spirits of public things. The white columns would have surrounded the food market. 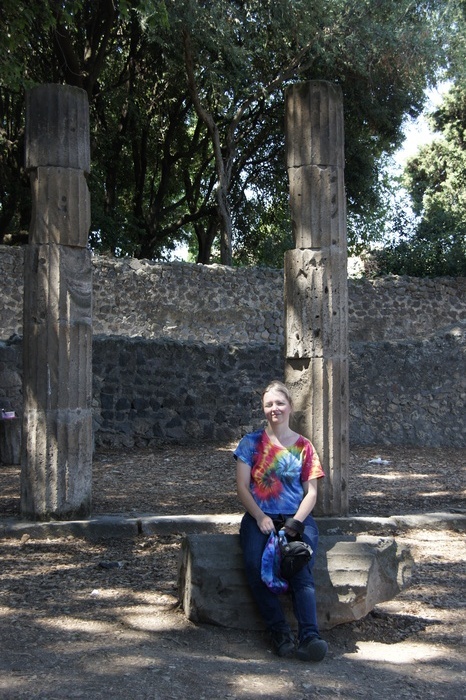 On the Forum, looking toward the Temple of Jupiter with Vesuvius in the background. Jupiter was the chief deity of Rome's many gods. Romans would swear oaths by invoking the name of Jupiter or Jove, which survives in modern times as the expression by Jove! The Romans considered the Greek Zeus to be the same as their Jupiter, and they may have been right - etymological investigation of the names indicates they may have been the same word once, and also share an origin with many other gods of the day/sky throughout the Mediterranian. This temple dates from the 2nd century BC. Originally the forum would have been lined with many statues, but most were destroyed in the earthquake of 62 and had not yet been replaced at the time of the eruption. Columns on the forum revealing a bit of their internal construction. 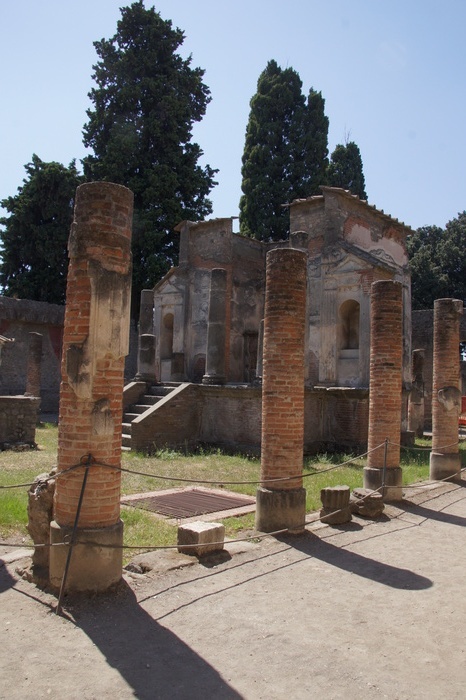 By this point in Roman history, brick columns with marble facade were fairly common. The Basilica, the most important public building in ancient Rome. In modern times, a Basilica usually refers to a large church. In the general sense, though, it is any building with an open area in the center and aisles down the sides. The large Christian churches took their design from the large Roman public buildings that preceded them. 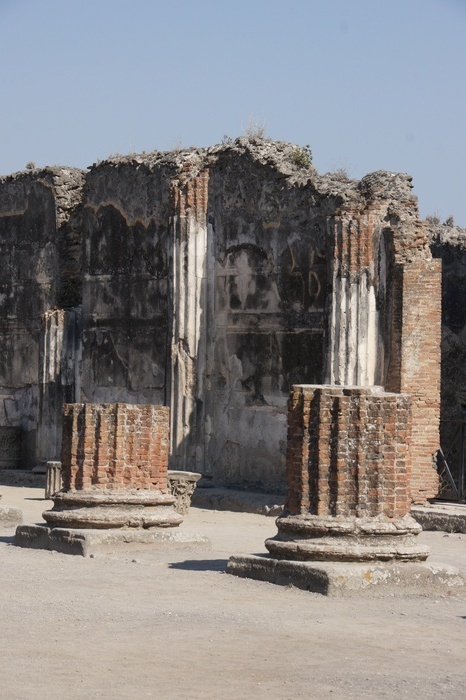 In Pompeii the building would have been a place for business transactions, settling of public disputes, and legal matters. 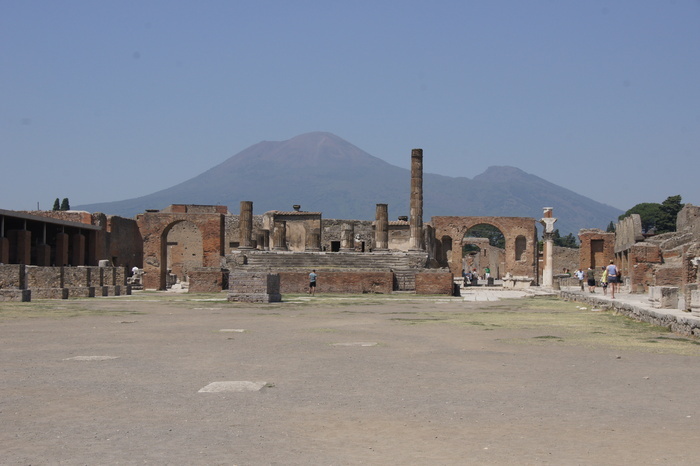 Mount Vesuvius behind the Forum.